Toronto guitarist Lorne Lofsky doesn’t record often enough to worry about too much of a good thing. Pity. A great future was predicted when he got The Big Break at 25: an LP produced by Oscar Peterson, for the US Pablo label in 1980. Lorne Lofsky, a trio date with bassist Kieran Overs and drummer Bob McLaren, is the belated followup. In the interim, Lofsky has not been much swayed by the popularity of the Scofields and Frisells; he remains true to an older, more traditional style, personalized by a quiet sort of virtuosity, a dry, sweet sound, and a variety of devilish harmonic twists. There’s the disconcerting ring of a Stanley Jordan to three overdubbed, two guitar pieces – if it’s intentional, it certainly flatters Jordan – but there’s a lot of more of someone like Lenny Breau to the eight trio tracks. 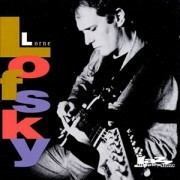 As that might suggest, Lofsky’s guitar playing is of the highest order. Can’t ever be too much of that.